I think it's weeknight-friendly if you are able to do a bit of prep work in advance (marinate the chicken, wash/tear the lettuce, etc). It only requires one pot for cooking (!!!!!!). I like to make homemade flatbread to serve with the rest of the meal, but you could totally just buy some pita at the store to save time. If you're making the flatbread, get that dough started first. You could even do this a day or so in advance and let the bread hang out in an airtight container. A short stint in the oven right before dinner will revive it. At least 30 minutes before you want to start cooking, start marinating the chicken. Olive oil, lemon juice, garlic, oregano, paprika, cumin, and coriander. Marinating is easiest and mess-free if you do it all in a large zip-top bag. Prep your salad, white sauce, and hot sauce. Brown the meat (patience is key here-- don't rush it! ), then set aside on a plate while the rice cooks in the same pot. Once the rice is done and transferred to a platter, the meat goes back in the pot for less than 5 minutes. Just long enough to finish cooking and heat up again. Put the chicken on top of the rice, and dot the whole platter with hot sauce, drizzle with white sauce, and sprinkle cilantro. The white sauce doubles as salad dressing. In a large zip-top bag, combine all of the marinade ingredients and the chicken. Toss everything around and let it sit in the fridge for at least 30 minutes or up to 2 days. Heat a large, deep pot with a lid over medium-high heat and add a small amount of olive oil, enough to coat the bottom of the pot. Cook a few pieces of the chicken in a single layer-- about 8 minutes on the first side, until well-browned, and about 5 minutes on the second side. Transfer to a plate and set aside. (If they're not completely cooked, it's okay. The chicken will return to the pot at the very end and can finish cooking at that point.) Repeat with the rest of the chicken. Wipe out the pan (there will be bits of stuff still stuck onto the pan, and that's okay) and add 1 tablespoon of olive oil. Once hot, add the turmeric, cumin, and rice and toast for about a minute. Add the chicken stock and salt. Bring to a boil, then reduce the heat to low. Cook for 15 minutes. The rice should be tender and all of the water absorbed. Let the rice sit for 5 minutes off the heat, then scoop onto a platter. While the rice is cooking, make the salad. 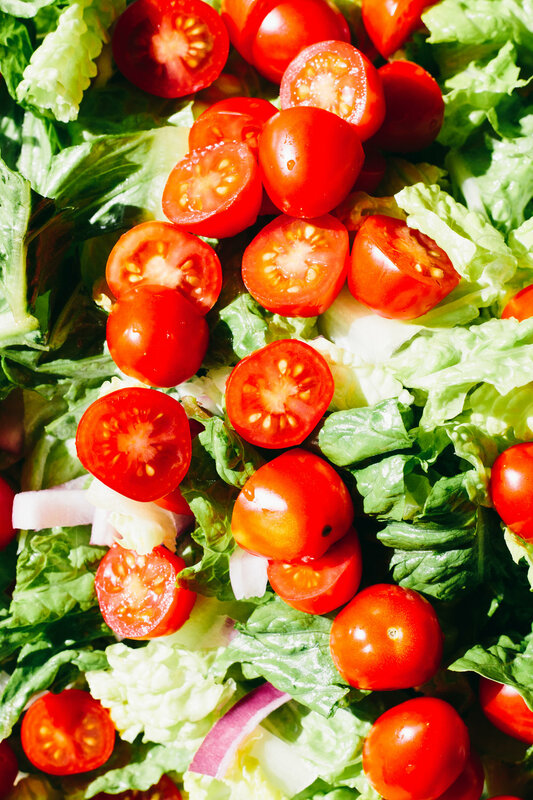 Toss the lettuce, onion, and tomato in a bowl and season with salt and pepper. Set aside. Make the white sauce by combining all of the ingredients in a small bowl. Set aside. Make the hot sauce by combining the hot sauce and the harissa in a small bowl. Set aside. Chop the chicken into bite-size pieces and add back to the pot. Cook over medium-high heat for 3-5 minutes until fully cooked through. Scrape the chicken onto the rice. Dot the platter with the hot sauce, drizzle with the white sauce, and garnish with cilantro. Serve with pita or other flatbread. Note: *If you don't have harissa on hand, you can make a substitute by combining 1 tablespoon tomato paste with 1/4 teaspoon coriander, 1/4 teaspoon cumin, 1 teaspoon chili powder, and a pinch of salt. You can also add 1/4 teaspoon caraway (I don't love caraway so I leave it out when using this substitute :)). In the bowl of a stand mixer, combine the water and yeast and let stand for about 5 minutes. It should be slightly bubbly. Add the olive oil and yogurt and mix to combine. Add the flour and salt, and beat for about a minute. Alternately, you could do all of this mixing with a wooden spoon and a strong arm. Transfer the dough to a well-oiled bowl and let rise for about 1 hour. Heat a cast iron skillet over medium-high heat. Divide the dough into 4 pieces. With well-oiled hands, work a piece of dough into a roundish shape. Add some olive oil to the skillet and gently transfer the piece of dough from the counter to the pan. It will want to tear; some holes are not the end of the world. Cook for a couple of minutes or until nicely browned, then flip and cook on the second side. Transfer to a baking sheet to cool. Repeat the process with the remaining three pieces of dough.